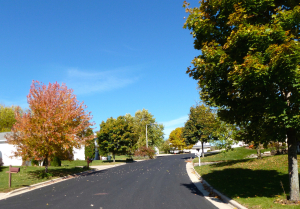 Listed below are homes for sale in Newberry Heights, a neighborhood located in Southwest Madison, WI. Listings are updated multiple times a day from the SCWMLS. For more information about any of these Newberry Heights homes for sale, just click the "Request More Information" button when viewing the details of a property. We can provide you with disclosures, past sales history, dates and prices of homes recently sold nearby in Madison, and more. And, for your convenience, register for a free account to automatically receive email alerts whenever new Newberry Heights listings come on the market that match your search criteria. Newberry Heights is quite literally a fairytale neighborhood for young families. The community is named after the John Newberry Award, which is awarded each year to the authors of outstanding children’s literature. Newberry Height’s streets are named after previous winners of the award. Byars, Fleischman, Lois Lowry, Ryland, Naylor and Raskin can all be found in the neighborhood. And neighbors are eager to write the community’s next chapter, too. Efforts to improve parks, paths and aesthetics throughout the neighborhood are perennially underway. Neighbors also work to foster a strong sense of community with events scheduled throughout the year. Ice cream socials are held each spring to celebrate the end of the school year. Picnics and bike parades are also regularly held in Newberry Park. Children who live in the neighborhood attend school in the Middleton-Cross Plains School District. Newberry Heights is a newer subdivision on Madison’s west side. There are about 60 single-family homes that were built on five cul-de-sacs here in the late 1990s. There are no through streets in the neighborhood, which reduces traffic. 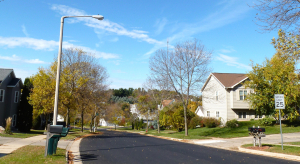 Lois Lowry Lane provides access to the neighborhood via South High Point Road and dead-ends at Newberry Park. Newberry Park features about two acres of green space, basketball courts and playground equipment. A grove of mature trees separates homes from farmland and a city water tower in the southern half of Newberry Heights. 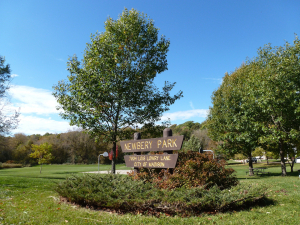 Parks close to Newberry Heights include Elver Park, Midtown Commons Park and High Point Park. Newberry Heights offers fast access to both surrounding communities. Downtown Madison is about eight miles east of Newberry Heights, and Middleton is about four miles north. Verona and Fitchburg are both about files miles south of the community, and Cross Plains is about 11 miles west. Popular commercial areas on Madison’s west side are also close by. West Towne Mall is about two miles away, and Hilldale Mall is less than six miles from Newberry Heights. Children who live in Newberry Heights attend school in the Middleton-Cross Plains School District. For information about finding a home in the Newberry Heights neighborhood or to sell your Newberry Heights home, contact our team for a better real estate experience. Newberry Heights neighborhood is located on the South West Side of Madison in MLS area Madison – W08. Below are more homes for sale in that area.